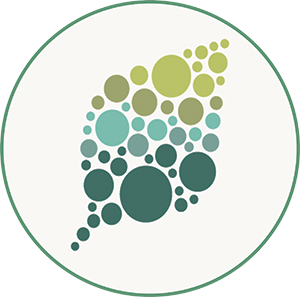 Plant and animal cells produce various types and sizes of extracellular vesicles (EVs). Mammalian EVs function in intercellular communication and plant EVs carry defense compounds, defense-related proteins, and RNAs and participate in the defense against fungal pathogens (reviewed in Hansen and Nielsen, 2017). Mammalian EVs transport small RNAs and plant 21–24 nucleotide small RNAs can move within the plant and from the plant to an invading organism, including pathogens and parasites. However, the small RNAs carried in plant EVs remain uncharacterized, in part because of challenges in purifying these vesicles. 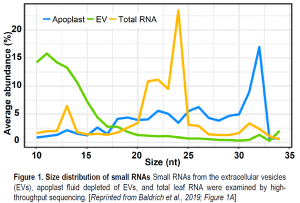 In a recent Breakthrough Report, Baldrich et al., (2019) examine Arabidopsis thaliana EV RNAs using their previously developed method to wash EVs out of the extracellular space of leaves. To examine the RNAs, the authors conducted high-throughput small RNA sequencing and compared the small RNA profiles of the purified EVs, the wash fluid after the EVs are removed, and of the source leaves. One of the surprises revealed by this comparison was the identification of a lot of “tiny RNAs” (tyRNAs), 10–17 nucleotides long (figure) that were strikingly abundant and diverse in sequence. Mapping the tyRNAs to the Arabidopsis thaliana genome showed that the tyRNAs derived from gene coding sequences, transposable elements, and intergenic regions. Moreover, many tyRNAs mapped to genes encoding microRNAs (miRNAs). These loci produce a precursor RNA containing 5’ and 3’ regions, and a stem-loop section, the stem of which forms the mature miRNA and its miRNA* reverse complement. The EV RNA samples included small RNAs corresponding to the mature miRNAs and tyRNAs from the 5’, 3’, and loop regions. The tyRNAs that map to one site in the genome tended to originate from the centers of mRNAs, consistent with exonucleolytic degradation from the 5’ and 3’ ends. Turning their attention to regular small RNAs in the 21–24 nucleotide range, the authors found another surprise, that the small RNA populations in EVs differed from the populations in the leaf samples, indicating that some small RNAs, particularly specific groups of miRNAs, are targeted to EVs. Moreover, small interfering RNAs were not enriched in the EVs. Therefore, this work showed that Arabidopsis EVs contain a diverse, but not random, population of small and tiny RNAs. This exciting study leaves us with myriad intriguing questions about the nature of tyRNAs, their potential functions, and the effects of the tiny and small RNAs found in EVs. For tyRNA function, the authors hypothesize that they could be waste products, act as small activating RNAs, or have other, unknown functions. Moreover, the observation that specific classes of miRNAs are loaded into EVs indicates that EVs may function in small RNA transport between cells or between a plant cell and an invading pathogen or parasite, another exciting avenue for future research. Therefore, we raise a glass to these tiny RNA-containing bubbles and look forward to toasting the next developments in this field. Patricia Baldrich, Brian D. Rutter, Hana Zand Karimi, Ram Podicheti, Blake C. Meyers, and Roger W. Innes (2019). Plant Extracellular Vesicles Contain Diverse Small RNA Species and Are Enriched in 10 to 17 Nucleotide “Tiny” RNAs. Plant Cell DOI: https://doi.org/10.1105/tpc.18.00872.